In February, there was a video of a Malayalam actress Priya Prakash from the song ‘Manikua Malaraya Poovi’ that went viral with just a wink. There have been videos like this from India or the rest of the world that go viral and start making the rounds across social media platforms. In March, there was a video, this time from Goa, which has made a young girl an internet sensation overnight, with the views on the original video having crossed 1 lakh in less than 24 hours after it was uploaded. It’s a video of young Dithi Lotlikar, giving a powerful rendition of the Chris Perry/ Lorna classic – ‘Apghat’. This is a song that can still rev up the Goan public’s emotions, a song that is sung by Konkani singers all over the state, and a song that was part of the collection that helped make the film ‘Nachom-ia Kumpasar’, a blockbuster hit. The video not only ranked up so many views online but has been downloaded and gone viral over WhatsApp , reaching Goan diasporas in the Gulf, Europe, UK, USA, Australia and so forth. Dithi, who has received praise from everyone including leading musicians, is the winner of the All Goa inter-school singing competition organised by Advents group, in the Konkani solo category. Her parents, who are based in Margao, were naturally overjoyed, and so were the parents of Nash Fernandes (Benaulim) and Crizelda Menezes Gama (Verna), whose videos have also gained huge popularity online. ‘With melody, modulation-magic and unconditional love for music’ – is what described Crizelda’s cover of ‘Rise up’ by Andra Day and it was her video that first caught the attention of many Goans. The video of the powerful ballad got everyone talking about the concept and about the singer, who won the third place at the All Goa singing competition in the English category. Nash , who was calm and composed and made guitar playing look easy withhis amazing instrumental solo performance of ‘Crying’ by Joe Satriani, also helps with the technical part of these videos such as working the mixer or shooting the other two videos. The trio, who have more than 2 and half lakh views between them, are class nine students of Vidya Vikas Academy; and they, along with their schoolmates are supported by their music professor, Neil D’cruz, who resembles Jack Black from the movie, ‘School of Rock’ with his ability to bring out the best among his students and help them pursue their passion. 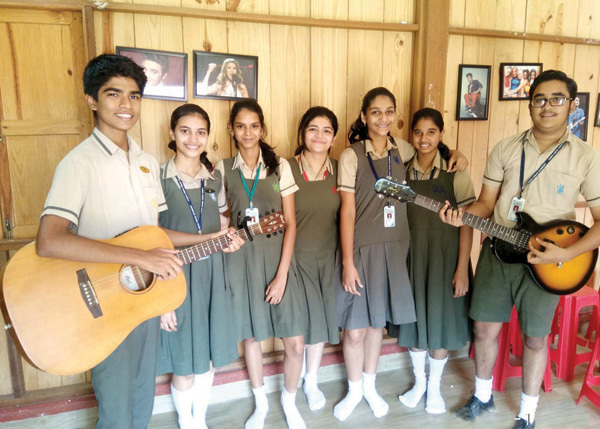 These three students have been the first of a long list of young talented singers and musicians from across Goa that Neil plans to promote, through his project called ‘Uncut Diamonds by Neil D’Cruz’. “I believed in their talent and I was sure it would have made an impact. I was thrilled of course with the overwhelming response and I want these videos to serve as a memory for these children, to look back say ten years from now and remember how they felt at this time, “ said a beaming Neil. Hailing from Carmona in South Goa, the singer, songwriter and vocal trainer, has over 18 years of experience in the music industry and is a well-known personality in the entertainment circuit for his gigs and showmanship. Having completed his eight grade in vocals, from Rock School, Trinity College London, Neil has a different style of teaching where he focuses on training the ear of his students and teaching them the fundamentals and nuances of performing. “I want my students to be able to play music practically, play by ear and not be fully dependent on sight. This means figuring out the right chords and key, just by listening to the tune when they don’t have the notes in front of them. I want them to learn how to play in a group/band, which means learning to coordinate with other type of musicians, understanding the sound of other instruments and genre styles, keeping up with the beat and also things that can help make them become better performers like stage presence, showmanship and the right diction ,” said Neil. He prides himself that his students have had live band performances at venues like Ravindra Bhavan all by themselves. This is where he started putting together the new platform that he has created to nurture and channelise the potential of young talent. What’s even more interesting is how the students are being motivated to write their own original lyrics and Neil felt the larger aim is to get his students to produce original songs, no matter how young they are. He gets them to try and be creative about their daily events or topical issues like child rights, unemployment, wars, and pointed out that anyone who reads some of these lyrics would be stunned with the quality of their writing. “That is the future, to have original songs and not just covers,” adds Neil who felt importance should be given to creating an environment that encourages original content as that can help a musician grow. Given how some of the comments on social media spoke about how ‘the students are not uncut diamonds, but diamonds that are already shining bright’, Neil explained why he chose to record their live acoustic performance as opposed to shooting in a recording studio where one can make edits and add effects. “What has captivated the public is what you can hear, their pure voices without any filter. Just their voices with the right pitch and it sounds heavenly and soulful,” adds Neil. Speaking about the use of social media, Neil said it was the response he got to the videos of him performing with his four-year- old son Dwayne where they won the Junior Herald Family Rockstars contest, that got him thinking about how he could use this as a tool to inspire his students. “I know that I can be there for my son and his music but I realised that I can be this person, who can help so many youngsters. 90 percent of Goans have that natural talent and we just need to push them and help train them as the sky is the limit. They will be ready for any national and international events and recognition,” added Neil. While thanking Vidya VIkas Academy manager and chairperson Nitin Kunkolienker and VVA principal Joble Bijoy for their support, Neil praised their Centre for Creative Excellence, where after school classes are offered to students (and not just of VVA). They have some of Goa’s best musicians joining Neil to teach the children different instruments (the Centre has other non music disciplines as well). Neil will be working with students from various age groups across Goa. Besides helping to guide them, there will be various activities and technical sessions, including interactions with guest artistes. He is also open to collaborating with others in the field that share the common vision and can help take his project to greater heights. When asked how he keeps up with what’s popular these days with the younger generation, Neil said that he enjoys all genres and keeps an open mind when it comes to music. Speaking about values and a message for young and upcoming talent, Neil said that he is always trying to learn and improve, a philosophy he tried to pass on to his students as it keeps one grounded. He will also use the platform- that will soon be up on YouTube and Instagram as well, to try and promote Goan culture and music and for now, a group song on ‘Hanv Saiba Poltoddi Vetam’ is what one should look out to next. When asked if they plan on having live concerts, Neil said that there is a lot of planned and that this is just the beginning. On a concluding note, talking about what is the best part of the project, Neil said it had to be the fact that this is giving everyone a chance to do what they love.